The PS Vita TV has problems. Cramming it inside an oversized handheld shell to make it "portable" is not going to fix any of them. But hey, bless the DekaVita 7 for trying. It's a 7" screen, with controls, that works by plugging a Vita TV into the back of it. Which, in theory, would give you a bigger PlayStation Vita. Only...why? 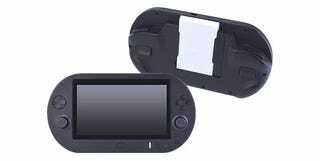 The Vita itself has a pretty big screen as it is, and what's more, every Vita game will work on it, while the Vita TV has compatibility issues (the DekaVita 7's screen won't work as a touchscreen, for example, because the Vita TV can't support that). I want to make more fun of it, but really, if you ended up buying a Vita TV, what's stopping you from making one more bad purchasing decision and just revelling in it?